Most businesses can benefit from using event tents at one time or another. 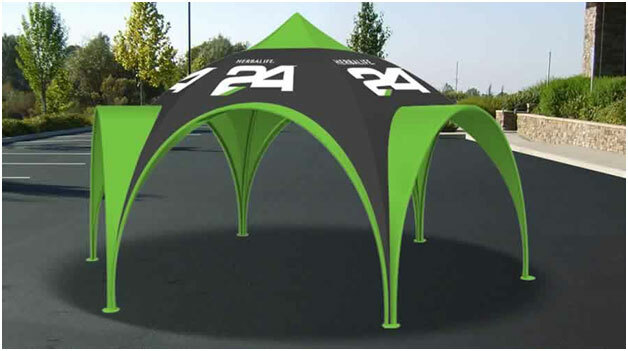 After all, well-constructed event tents are one of the most effective ways to display professionally and safely when conducting business outdoors, but offer opportunities for displaying indoors, as well. But how, exactly, can event tents work to help you promote your unique business? If you’re feeling uncertain of how your business can benefit from an event tent, or which style is right for you, then you’re in the right place. In this post, we’ll offer up six spectacular suggestions for how to use event tents. Perhaps you haven’t yet explored displaying with an event tent and are looking for initial inspiration, or maybe you’ve displayed many times and just want to try something new. Either way, you’re bound to find some great ideas for displaying event tents in a variety of different methods and settings. Display a pop-up tent at an outdoor event. Pop-up tents are one of the most common and recognizable types of event tents. These tents are fairly simple in construction, composed of a canopy which is held up by posts. 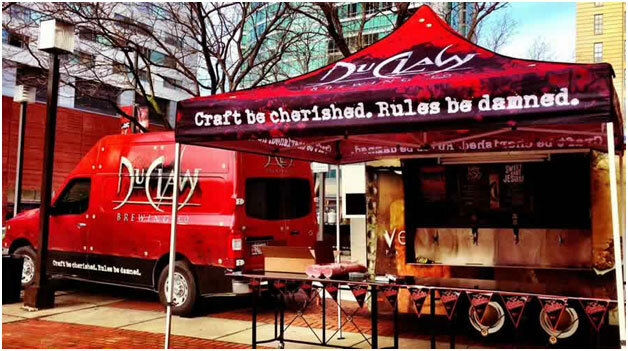 They are available in a wide variety of sizes and shapes, and the canopy can be customized with your branded graphics. Pop-up tents are one of the most versatile types of event tent to display at outdoor events. Whether it’s a concert, a craft fair, farmer’s market, or downtown street fair, their rectangular or square proportions make them easy to set up and display in a way that works well in a “group” setting of displays. Use an outdoor tent to promote a sale or event outside of your place of business. It can be difficult to advertise a sale or event that is going inside of your business. Signage is very helpful in this regard, but an event tent can really bring the point home, offering a creative retail marketing solution which will draw customers in from the street or make them stop while driving by. The next time you are offering a big event or sale at your place of business, consider displaying an outdoor tent in your parking lot or in a prominent space in front of your place of business. You can use the tent as an information booth to direct customers toward the sale or promotion indoors or offer giveaways or promotions from the tent to support your event. It’s a great way to engage customers and bring them in! Use a Teepee tent to make a statement. If you have the space for it, there’s no better way to make a statement than with a teepee tent. Measuring in at 40 feet wide by 20 feet tall, this event tent does require ample space, but provided you have it, it’s a great way to ensure maximum impact. With its star shape, it provides plenty of space and has the added benefit of supplying shade for your entertaining. 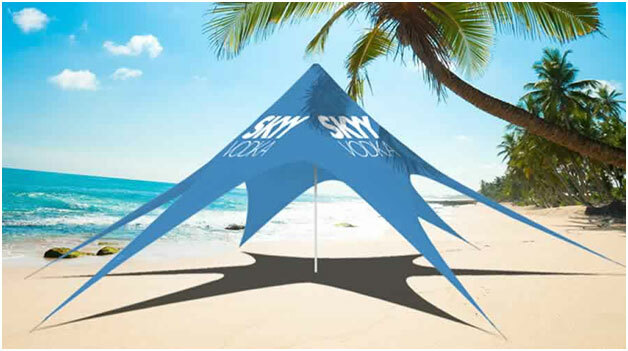 This unique design is ideal for park events, beach parties, festivals, and sporting events. Let the teepee tent draw interest for your brand, and leave a lasting impression on customers both old and new. Advance your branding with an inflatable tent. 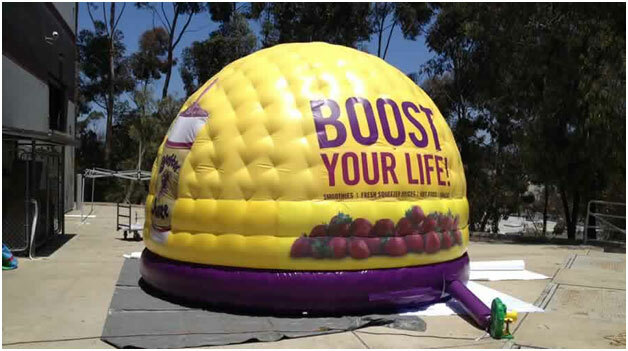 Advertising inflatables are one of the most eye-catching ways to grab customer attention. Inflatable tents are absolutely effective at commanding attention, creating a unique visual / brand presence. Their unique format and high visibility will draw the eyes of curious potential customers no matter where you present them. There are several different options for exploring inflatable event tents for your business. The Aire Cap boasts a unique design with open sides and a vaulted, sphere-like “ceiling”; the show shell provides an advertising enclave; the large (20x25 or 30x40 feet) Spider Tent is perfect for creating an impactful display. Let a show shell protect you from the elements. While a show shell is equally effective as a display unit at indoor or outdoor events, it has a particular benefit when displayed out of doors: it provides ample protection from the elements. This means that if your event is taking place on a rainy or windy day, the show shell provides better protection than many other event tents, which means that your customers can enjoy greater comfort by browsing what you have to offer or chatting with employees. It’s bound to make customers make a beeline to your display over others. Use an action tent to make a splash indoors or out. As the name implies, these tents are built for action. 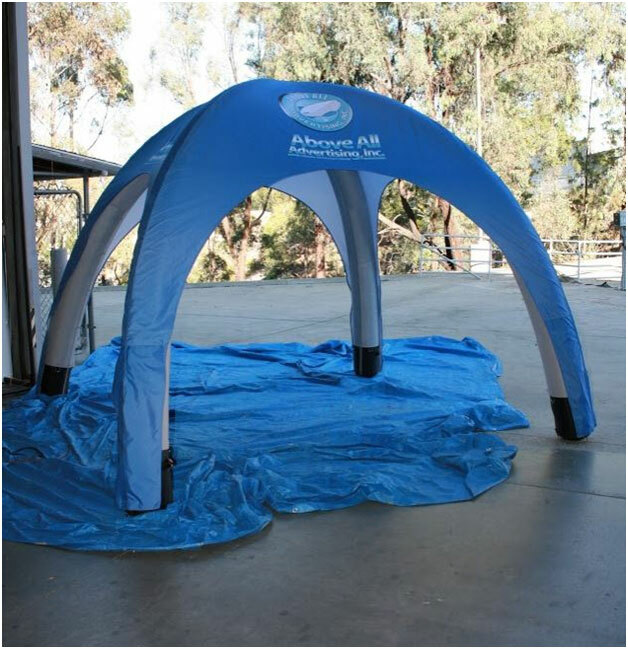 The action tent, which is available in a variety of sizes (10, 14, and 20 feet tall) is ideal for outdoor events such as sporting events because it has a strong steel base structure which is pieced together to erect the completed unit, which means that it’s super sturdy. But it is also set apart in its design because they offer more head space for your guests as well as a large amount of material that can be printed to match your marketing campaign. By adding logos, messages/text to these units; you can secure continuous visibility for your brand and offer an engaging and entertaining advertising solution. But far from a one-trick pony, these visually appealing tents can make a splash indoors, too. At trade shows which allow flexibility in your display format and type, this can really help you differentiate your business from the rest with your display. Conclusion: Just about any type of business can benefit from employing event tents as part of their advertising and promotion efforts. Far from single-use display units, event tents provide ample opportunity for promotion at trade shows, street fairs, and beyond. With a wide variety of styles, shapes, and sizes, these visually appealing displays can be used indoors or out, in a number of different creative ways. These ideas represent just a few of the many ways in which event tents can help benefit and promote your business. How could an event tent benefit your business?